When Christian Ekstrom, a local diver, finally got to explore a sunken two-masted schooner he had known about for years, he found bottles, lots of bottles, so he brought one to the surface. Mr. Ekstrom, 31, a compact man with a shock of blond hair, brought the bottle to experts in this town of 11,000 on Aland Island, which lies midway between Finland and Sweden, then to others in Sweden and finally in France. Though the bottle had no label, burned into the cork were markings that made clear it was a bottle of Juglar, a premium French Champagne that ceased to be sold under that name after 1830, when it was renamed Jacquesson, for another of the winery’s owners. It remains one of the smaller but finer producers of French Champagnes. “You could still see the bubbles, and see how clear it was,” Mr. Ekstrom said. The 75-foot wreck, in 160 feet of water, contained other cargo as well: crates filled with grapes, long withered; carpets; coffee beans; spices including white and black pepper and coriander, and four bottles of beer. Not including the bottle Mr. Ekstrom swigged from, the divers soon discovered a cargo that numbered 172 bottles of Champagne. Four were broken, but 168 others were intact, and in early August they were hoisted to dry land and stored in Mariehamn. The Baltic Sea floor proved an ideal wine cellar, with 40 degree temperatures, total darkness and enough pressure to keep the corks in. Gradually, word got out to the Champagne world, and this November experts from abroad, including from Jacquesson and Veuve Clicquot, were invited to Aland (pronounced AH-lahnd) to replace the crumbling corks in 10 bottles and for a tasting. 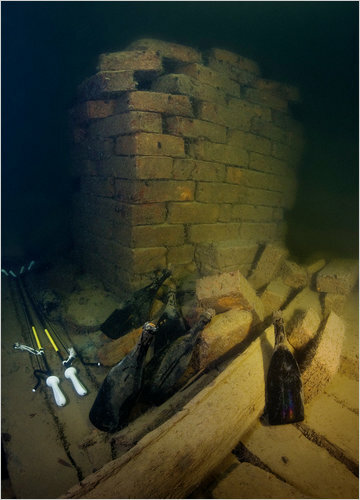 In the meantime, the Champagne had become the property of the local government, which lays legal claim to anything found in undersea wrecks that is more than 100 years old. The first three bottles recorked were Juglar, but on the bottom of the fourth cork were the star and anchor of Veuve Clicquot. The star represents a comet that crossed the skies of Champagne in 1811 and supposedly caused fabulous vintages. “I thought, ‘Madame Clicquot is watching us,’ ” Mr. Ekstrom said. At another recorking, further bottles of Veuve Clicquot appeared. François Hautekeur, a Veuve Clicquot winemaker who attended, pointed to the name Werle branded into the bottom of the cork, referring to Édouard Werle, the man who in 1830 assumed much of the business from the Widow Clicquot, actually Barbe Nicole Clicquot, née Ponsardin, who inherited the company from her husband in 1805 and ran it until her death. “So it is later than 1831,” Mr. Hautekeur said. Jean-Hervé Chiquet, whose family now owns and operates Jacquesson, the winery that absorbed Juglar, said that the shape of the bottles and the use of the name Juglar indicated the Champagne was from the late 1820s, and may have been stored for some time before it was shipped.